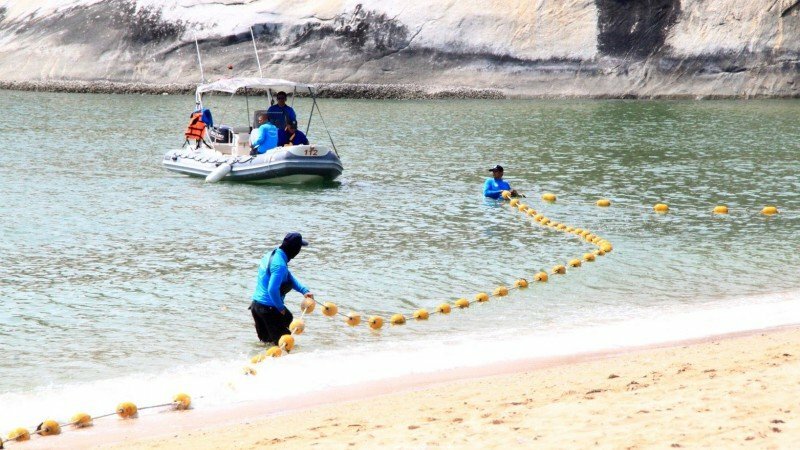 Thai media reported that a full two months after a Norwegian tourist was bitten by a shark at Sai Noi beach near Hua Hin there is still no safety net in place. Werner Danielsen, 54, was bitten on the leg on April 15th in a story that made national news. There was initially a flurry of activity and interest with signage and buoys appearing within days as the foreign victim was visited by dozens of well wishers in hospital. The local authority agreed to pay half a million baht from council coffers for a net, reported New TV. But now Wan Chatree of the department of marine and coastal resources Region 4 has had to admit that he has been unable to get his hands on the funds to buy the net. And tourists in the area are still vulnerable to attack. Now I wait for the excuse: we cannot use the net because Thailand respect the Illegal, unreported and unregulated fishing (IUU) policy. How many more attacks since? IMO these nets are not a good idea, and damaging lots of marine life. No more attacks have occurred, so there seems to be no need for net. installing a shark net for one solitary bite is utter stupidity. Nets are not that effective anyway. Given the common flu kills 250,000 a year and sharks kill a few there is no need for nets. I go to this beach all the time. just put up high quality signs in English, Chinese and Thai warning about the sharks. Firstly the proposal must go in front of committee, Then an assessment to be done, back to committee then costs worked out including percentages that will be added to make sure everybody is happy. Then back in front of committee, to confirm what they are doing as everybody has forgot. So back to stage one, money has been allotted but, has they are no way ready, spilt and hold in bank accounts, till ready. One year later one of two things happen. 1, OMG what this cash in my bank account, it must be mine...Spend! 2. Committee meets decides it needs 12 signatures from people in power, but, nobody will admit who should sign, Give up and go home! OK, so what is new ? There have only been 5 shark attacks in the whole of Thailand in the last 50 years, (not including this one) 2 of them fatal. Every incident in a different part of the country. The danger is so remote that shark nets and the like are pretty much an overkill. The net is a completely pointless idea. One minor attack in how many years? Perhaps that amount was paid, just nothing left for the net. Is there really any point in putting in nets for 10-20kg bull sharks? That's like a good size pike! Does this suprise anybody that the authorities just don't give a hoot ?!! Besides if the sharks don't get you, the pollution will ultimately do so....so stick at your salt water pool at home and you'll be fine ! The money from funds to be used for shark net is gone mysteriously, Or has anyone eaten them?